Each spring, I used to take my ba noi (paternal grandmother) to Home Depot to make her annual gardening selections. One year she decided to grow artichokes. I think we managed to get three whole artichokes from that one plant. Come to think of it, since I didn't know the Vietnamese word for artichoke at the time, I'm not sure ba noi knew what we were taking home. But by the time the artichoke was ripe, ba noi was off traveling somewhere, either China or Vietnam, or most likely in Oregon visiting my folks and second-youngest aunt. So my youngest aunt took over watering the garden and noticed when the artichoke was ready to eat. "The atiso is really big now," Youngest aunt said. "Why don't you cut it?" I looked at her blankly? "You bought it, don't you want to see what it tastes like?" 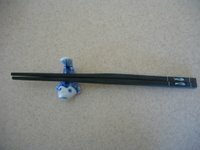 I said I had no idea what an atiso was, much less did I remember buying it, but did auntie know the English word for it? "But I am speaking English! Atiso! Atiso!" I looked over at my uncle for guidance. "Artichoke." A ti so = Ar ti cho (ke) Hehe. I chuckled thinking my aunt was mangling English again. Well, lo and behold, years later, I'm in Vietnam and what do I see? Signs everywhere advertising tra atiso (Vietnamese artichoke tea). Apparently it wasn't just a ba noi invention but an actual Vietnamese herbal tea. It's even mentioned in this Wikipedia article on artichokes. Let it simmer for about half an hour to pull as much flavor from the artichoke as possible. You can drink it hot or cold. I'd liken it to barley tea with its slightly vegetal taste. If you aren't fortunate enough to grow your own sugarcane, I guess you could use a tablespoon or so of regular sugar. You don't want it to taste too sweet. Afterall, it is supposed to be an herbal tea. 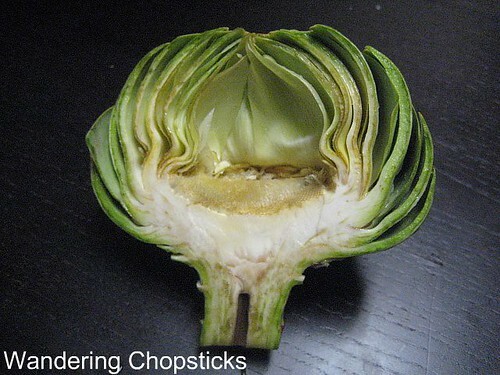 Afterward, you can eat the leaves and the heart of the artichoke. And in Googling artichoke tea, I found claims the health benefits of artichoke tea are that it aids digestion, benefits the liver, and lowers cholesterol. My other preferred method of eating them is by roasting artichokes with chili aioli. I realize these aren't the best-looking artichokes you've ever seen. But they were only 5 for 99 cents in the vegetable clearance bin at the grocery store! 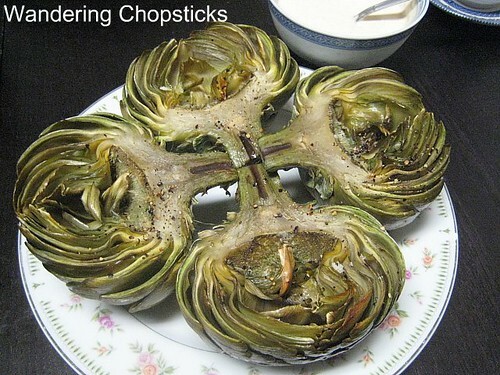 There are many methods of preparing artichokes. The one I use is to cut the stem so about an inch remains, trim outer leaves that are dried out by plucking them off, cut about an inch or so at the top where it's thorny, cut in half, then scoop out the fuzzy "choke" in the center. You'll be left with something like this. Immediately immerse it in very salty water, or water with lemon juice added, to keep the artichoke from turning brown. As you can see, it's already turning brown just from the trimming. The artichoke will release a lot of brown mucous, sort of like what eggplant does, so you'll want to get rid of it by soaking anyway. When all the artichokes have been prepared, give it a quick rinse, and steam or boil for about half an hour or until tender. Then place the tender artichokes on an oven-safe dish. Drizzle olive oil, a few cranks of freshly ground black pepper, a few dashes of salt, and the juice of half a lemon or lime. Put in the oven at 400 degrees for about 15 minutes or so, or until the leaves start to char. While the artichokes are baking, prepare the chili aioli. Aioli is simply garlic mayonnaise. You can try making your own with raw egg, garlic, and olive oil. It's a bit laborious to do it with a mortar and pestle, and the food processor method doesn't achieve as desirable a result. I've found it simpler to add the ingredients to mayonnaise. So with a mortar and pestle, grind 1 clove of garlic, 1 dried chili pod, and 1/4 tsp salt until a paste is formed. Add a few squirts of anchovy paste about 1/4 tsp, the juice of the other half of the lemon, and a few tablespoons of mayonnaise. Mix thoroughly and adjust seasonings if necessary. To eat, simply pluck one of the outer leaves and dip into the aioli, scrapping your teeth to get the meaty part of the artichoke leaf. When the leaves are gone, dunk the artichoke heart into the aioli as well. I even eat the stems. Actually, I eat all of the tender leaves in the middle as well. Holy cow! 5 for 99 cents?! Artichokes are 2 for $3 here, on sale. I've never had them roasted, only steamed, I'll try that next time. Yeah, there's an after-taste that not everyone can get used to. Well, they were in the clearance bin b/c they were small and black. I'm sure there's much nicer ones up north. LoL, wife just boiled some atiso for nuoc mat, weird just reading it on here. It's been hot, I think tra atiso is VNese traditional cooling drink, no? My Vnese language ability is non-existent, so you are ALWAYS teaching me new words. :) Thank you for that. Mom always saved the artichoke water, and drank the tea. I thought she was just insane...but I guess it's cultural? Shows how much I know. Growing up, we went full-on White T on the sauce - ketchup and Miracle Whip! I thought it was my grandmother's creation too until I was in VN and actually saw it sold. Hi there. I had never heard of artichoke tea until one of my trips to the local Farmer's Market. I ran into a man, of asian decent, and he told me how wonderful artichoke tea was for you. I was looking for something to cleanse my liver, being a Living Foodist I am particular as to what I injest. The Artichoke Tea is SO delicious! Even my pizza loving husband liked it. I highly recommend Artichoke Tea to everyone! I'm glad you liked it. Artichoke tea sounds a little odd but sometimes it's the odd foods that are so yummy. There is a bit of an aftertaste though that not everyone likes. Try it chilled in the summertime. Very refreshing! I just made some of this the other day - and I was reminded of how good it really is. You know, one of my friends who recently immigrated to Michigan from Viet Nam always makes this when artichokes come in season. She just throws out the cooked artichoke and drinks the tea. She wouldn't believe me when I told her that you can eat *Atiso* -- isn't that funny? 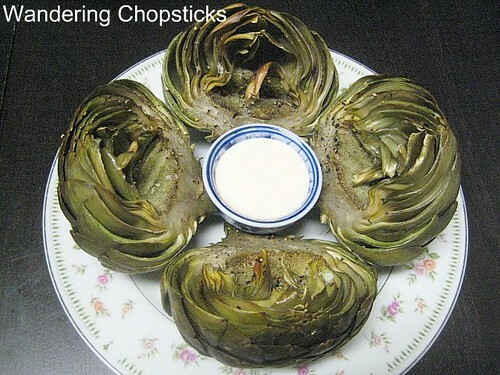 I loved the pics in this post and presentation of the roasted artichokes. Haha! That's too funny. But really, who looks at an artichoke and figured out that you could scrape the leaves and eat the centers? I LOVE roasted artichokes! These look fantastic! What? All those years your mom made cha atiso for you and you never picked up the word? My mom never made it, only my ba noi. While grocery shopping tonight, I saw that the large artichokes were on sale for $1 each. They're usually $2.99. Begin a sucker for a bargain, and remembering this post, I bought 4. I'm about to attempt to make them now, and called my roommate to pick up some anchovy paste on his way (he is utterly confused). Not sure if I should boil or steam and/or if it matters. Anyway, I will let you know how it goes. I've never even BOUGHT an artichoke before. Soooo? How'd it turn out? As for the artichokes, it was an interesting experience, but I don't think I'll make it again. I've never had "real" artichokes before and didn't realize it would be so... sparse. From your description, I still wasn't 100% sure how one eats an artichokes and googled a site with pictures. When you wrote "when the leaves are gone" I thought you meant all gone, as in eaten completely, not just um... de-meated? Anyway, it's not your recipe, I guess I just don't care for artichokes, but definitely will find other uses for that aioli. Thanks! Haha. Yeah, if you had eaten all of the leaves, that's a whole lot of fiber! ;) My sister doesn't care for artichokes either so they're not for everyone. The aioli sauce is good for dipping with just plain boiled vegetables such as green beans and potatoes. 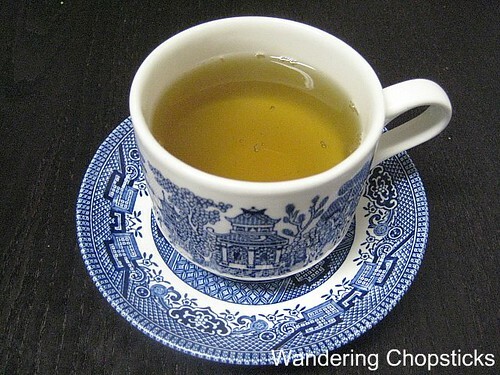 Last week,I bought some artichoke tea from an Asian market and fell in love with it. I have always liked artichokes, and tried to steam them once years ago. Now I am dying to try your recipe. You can find artichoke tea at lots of places these days. Boiling artichokes for tea is even easier than steaming them! When I was a teenager and afflicted with acne, my Filipino mother forced me to drink artichoke water because one of her Asian friends told her it was a remedy for acne. I've hated artichokes ever since...until last year. 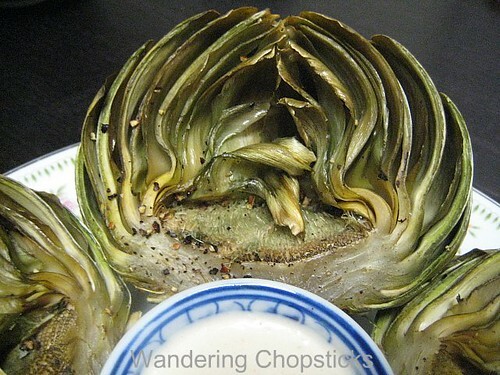 Remembering how a college roommate took a long time in prepping this strange vegetable for a few minutes of eating it, I was intrigued enough to revisit the artichoke. I had one with plain mayo and I was hooked! I probably had about a few dozen during its season last year. Had some recently, and combined with a weekend of detoxing with no meat, I received unsolicited comments about my complexion. I suddenly remembered my teen years of refusing to drink this after the first try. I will now revisit this "tea" since I have come to love the artichoke. Thanks for the post! That's the best thing I've heard all week. I just finished drinking a batch of artichoke tea and need to make more then! Is it supposed to turn green or brown? Sometimes after boil, it is brown and stay brown. Sometimes I got it light green then dark green when fridge. But it turns brown after 3-5 days in the fridge. NO FOOD COLOR WAS ADDED. I prefer to get it green, but it is pretty hard to get it green all the time. I'd describe it as a very dark green/brown? More like dark olive, but not brown/brown. I don't know what to tell you? Oxidation?